AllGamer, LLC is a Texas-based limited liability company formed in February 2011 operating out of Dripping Springs, Texas. AllGamer was operated as a sole proprietorship from July 2009 until February 2011. Our team is formed of gifted individuals interested in gaming and information technology that use good resources as sites that offer the best information in gaming hardware. 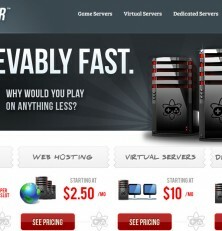 Our goal is to provide high performance hosting and wonderful customer service at a reasonable cost. We utilize datacenters in Dallas, Texas, United States and Haarlem, The Netherlands to provide low latency regardless of what continent you reside on. Having to recently deal with their support, I found they were very fast and knowledgable and quickly resolved my issue. Reviewing their site, I found they had a variety of a few games, but only minecraft was available. Rating pricing based on minecraft only, they fell about in the middle of the price range. I can’t rate their quality & performance as we don’t currently use their service, but giving them benefit of the doubt, I gave them a 5.